When Mahaffey Fabric Structures was contacted by a renowned equipment company in need of a large lunch space. The client needed a durable, temporary fabric structure to accommodate 300 to 350 occupants. Our team of skilled and expert project managers rose to the task as quickly as this lunch break tent did. The company was using a standard pole tent to serve as its existing on-site lunch area. The tent had tears and leaks throughout and was caving in. The AC ducting was insufficient, and the tent was not air-tight. Furthermore, industrial mats were currently serving as flooring for the tent. This was not a suitable environment for anyone, especially such a hugely-staffed company. The main challenge in this instance was the location of the structure. The structure needed to be built on top of a pipeline. Because of the unique site, our client felt there was not a way to utilize a standard temporary structure. Mahaffey inspected the existing site and proposed an ideal solution for the challenging location of this project. Mahaffey installed a 20m x 25m (66’ x 82’) MegaStructure to serve as our client’s lunch space. The structure housed three HVAC units, and crew members installed ambient lighting throughout. The structure was lined with ExpoDeck flooring, which has proven to be suitable on virtually any ground surface. To stabilize the structure on the terrain, Mahaffey’s crew installed concrete blocks for anchoring. This custom anchoring is atypical for crew members, as they are more accustomed to using stage anchoring. Although the anchoring-type was out of the norm, our expert crew installed the structure with no issues. Our client was immediately pleased with the seamless design of our temporary structure. We provided them with a 30 percent larger structure, accommodating up to 350 occupants. 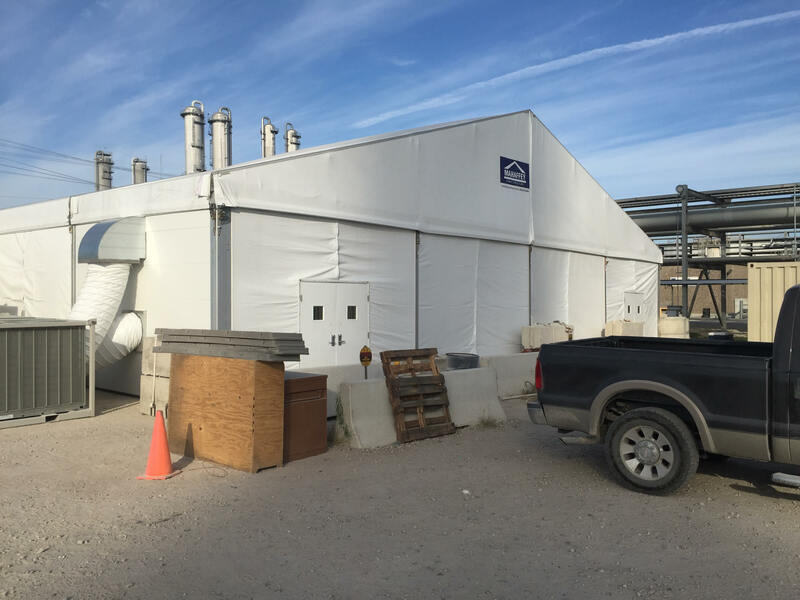 The clean design housed industrial flooring, which eliminated the many hazards presented by the previous tent’s “flooring.” The ducting of our structure was strong, eliminating potential climate issues. This structure provided our client’s business with better functionality overall and less money spent (due to a more durable structure), leading to less time spent fixing structural issues. Interested in learning more about temporary lunch tents and fabric structures for break areas?